The largest crater associated with a March 2012 impact on Mars has many smaller craters around it, as seen in this image from the High Resolution Imaging Science Experiment on NASA's Mars Reconnaissance Orbiter.NASA / JPL-Caltech / Univ. of Ariz.
An eagle-eyed NASA spacecraft spotted a fresh crater on Mars large enough to cover half of a football field. NASA's Mars Reconaissance Orbiter captured the photo of the 159-foot-wide (48.5-meter wide) Martian crater after it suddenly appeared in March 2012. Mission scientists say it's the biggest fresh impact crater identified on any planet by using before-and-after images. The crater was probably carved by a car-sized asteroid, in an impact event similar to last year's meteor explosion over Chelyabinsk, Russia, which shattered windows, damaged hundreds of buildings and left more than 1,000 people injured, NASA officials said. The scar on Mars was first noticed about two months ago by Bruce Cantor, a scientist with Malin Space Science Systems who puts together weekly Martian weather reports. Cantor spotted an unusual dark dot while he was looking for dust storms and other events using images taken by the Mars Color Imager, or MARCI, a weather-monitoring camera built by MSSS and operating on NASA's Mars Reconnaissance Orbiter. "It wasn't what I was looking for," Cantor said in a statement. "I was doing my usual weather monitoring and something caught my eye. It looked usual, with rays emanating from a central spot." By going through the archives of daily images of the site, Canton figured out when the impact event occurred. The crater was absent March 27, 2012, and appeared sometime before the photo opportunity, on March 28, 2012. 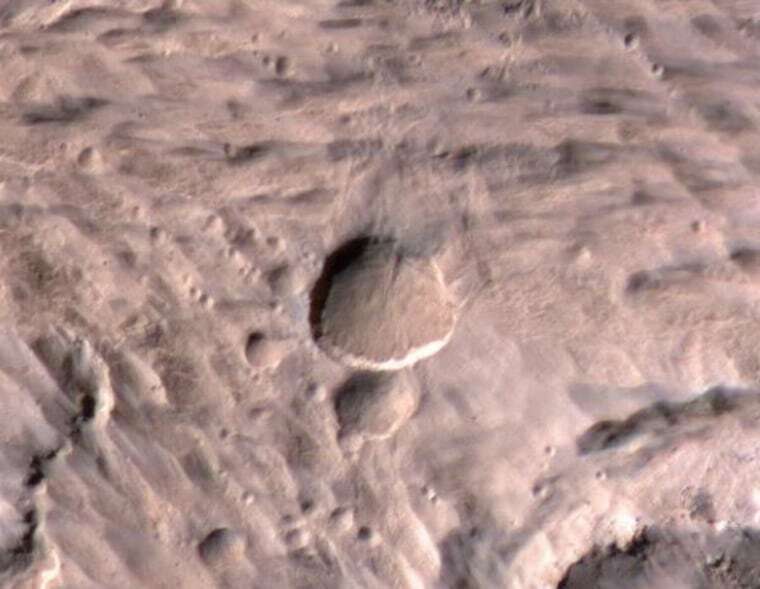 Subsequent images taken with the orbiter's Context Camera and High Resolution Imaging Science Experiment, or HiRISE, revealed that there are two main craters at the site, surrounded by smaller pockmarks. Darkened slopes in the 5-mile (8-kilometer) area around the craters suggest that shock waves from the blast triggered landslides, NASA officials said. The largest crater was probably created by an object 10 to 18 feet (3-5 meters) long, HiRISE principal investigator Alfred McEwen of the University of Arizona said.